This Sanskrit Studies Method course is an introduction to the Sanskrit language and the culture of the modern yogi. We will look at select sounds of the Sanskrit alphabet, two commonly chanted mantras in yoga classes around the globe. We’ll practice pronouncing select asana names. You’ll also be introduced to Luminous Soul Meditation and select principles for authentic yogic living. Immerse in the Luminous Soul Meditation practice, which teaches you how to soothe the mind and return it to a natural energized peaceful state, no matter the challenge. Develop insight into why Sanskrit is called the language of vibration and why that’s important. Practice Luminous Soul Meditation to help you access peace at any time. Become skilled in chanting two select mantras which are popular in yoga classes around the world. Get practice reading the Sanskrit letters in their original form called devanagari, as well as, in the transliteration script. You’ll leave this Sanskrit Studies Method: Introduction to Sanskrit workshop feeling more confident and knowledgeable in your understanding of Sanskrit and how to incorporate good pronunciation and Luminous Soul Meditation into your life. Description: This course is an immersion into the Sanskrit language through the study of the Sanskrit alphabet, it includes asana names, select mantras, and Luminous Soul Meditation and principles. and develop insight into why Sanskrit is called the language of vibration and why that’s important. Practice reading the Sanskrit letters in their original form, called devanagari, as well as in the transliteration script. This course continues from the Sanskrit Alphabet Module 1 and introduces more complex word structures. Delve further into the complexities of the Sanskrit alphabet. Understand how to write combination letters and read and write words in Sanskrit. Practice Luminous Soul Nada Yoga Meditation, which teaches the mind to rest in sound and vibration. The Gita Series offers students an opportunity to work directly with the profound teachings of the Bhagavad Gita. In Manorama’s Warrior Within courses she elucidates how the Bhagavad Gita and its main characters reveal that each of us has an inner warrior. She describes how to work with these inner warrior principles. In all the Gita Series courses Manorama leads chanting of select Bhagavad Gita verses. The Gita Series is supportive towards building confidence in your yogic studies. Gain direct access to select Sanskrit verses – through the Bhagavad Gita. During this workshop of personal and spiritual exploration combined with Bhagavad Gita study Manorama guides participants in understanding the notion of the Inner Warrior in the Bhagavad Gita. The Sutra Series gives students an opportunity to work with the Yoga Sutra of Patanjali. A definitive text on Yoga. Manorama offers historical details about Patanjali and his life. She teaches students how to pronounce select sutras. She gives students a process by which to work with all the sutras. Fun, engaging and confidence building. The Luminous Soul Nada Yoga Series gives students an opportunity to immerse in the subject of Nada Yoga (Yoga of sound) with Manorama. Through the lens of Luminous Soul, Manorama offers guidance and insight into this vast yogic subject. Manorama gives students practical exercises and a process by which to engage this topic to evolve their practice. Fun, engaging and deeply transformative. In this Luminous Soul course: Immerse in the subject of Nada Yoga, you will discover what nada is, how it is connected with OM, and how to begin working with this vast yogic subject. Join Manorama and study the mystical sound that resides within you. Learn the value of Nada Yoga in your life. This course includes chanting, a guided Luminous Soul Meditation and question and answer period, as well as Luminous Soul take-home exercises to evolve your practice. 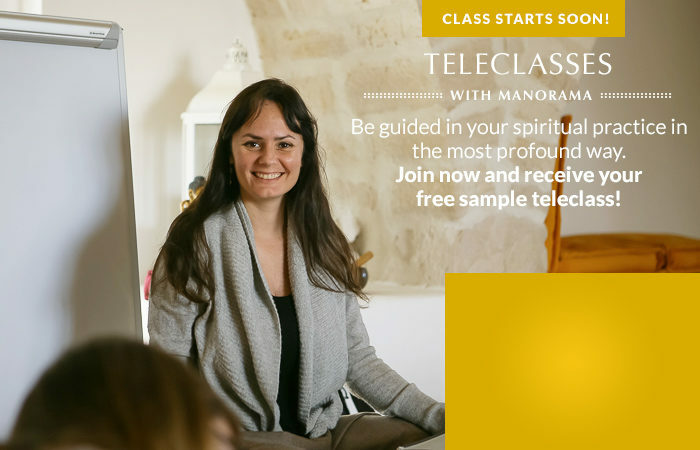 In this Luminous Soul teleclass: Mantra Yoga and Nadam, you will learn what mantra yoga is and the powerful connection that exists between mantrik vibration and nadam. Manorama will translate what ancient scripture says about the science of vibration and how that relates with nadam. She will guide students in directly experiencing the mystical relationship that exists between conscious sound and yoga meditation. This course includes chanting, a guided Luminous Soul Meditation and question and answer period, as well as Luminous Soul take-home exercises to evolve your practice. In this Luminous Soul teleclass: The Art of Engaging Nada Yoga, you will learn how to work with nadam and OM in your home yoga practice. Manorama will discuss the relationship between nada and witness consciousness, as well as the value of practicing nada immersion in meditation. She will speak about the powerful connection, which exists between nada and the mind. This course includes chanting, a guided Luminous Soul Meditation and question and answer period, as well as Luminous Soul take-home exercises to evolve your practice. Practice chanting of The Maha Mrtyunjaya Mantra (The Great Death Conquering Mantra). Manorama will give commentary on this Sanskrit verse and will discuss, who is Lord Shiva and how understanding him helps the aspirant relate, in a Yogic way, with death and life. discusses the yogic significance of Arjuna and his mystical bow. In this two part series, Manorama leads chanting of select Sanskrit verses from the Atmabodha. She will discuss the rich yogic meaning contained in the text on Self Knowledge and will offer Luminous Soul teachings on how to work with these verses in your daily life.